For step-by-step videos on how to install KNIME Analytics Platform, please take a look at our KNIMETV YouTube channel. Go to the download page on the KNIME.com website to start installing KNIME Analytics Platform. Now open the Download KNIME tab and click the installation option that fits your operating system. The Windows installer extracts the compressed installation folder, adds an icon to your desktop, and suggests suitable memory settings. The self-extracting archive simply creates a folder containing the KNIME installation files. You don’t need any software to manage archiving. The zip archive can be downloaded, saved, and extracted in your preferred location on a system to which you have full access rights. Windows: Run the downloaded installer or self-extracting archive. If you have chosen to download the zip archive instead, unpack it to a location of your choice. Run knime.exe to start KNIME Analytics Platform. Linux: Extract the downloaded tarball to a location of your choice. Run the knime executable to start KNIME Analytics Platform. Mac: Double click the downloaded dmg file and wait for the verification to finish. Then move the KNIME icon to Applications. Double click the KNIME icon in the list of applications to launch KNIME Analytics Platform. Also check the KNIME Quickstart Guide and the KNIME Workbench Guide. When installing KNIME Analytics Platform, configuration settings are set to their defaults, and they can later be changed in the knime.ini file. The configuration settings, i.e. 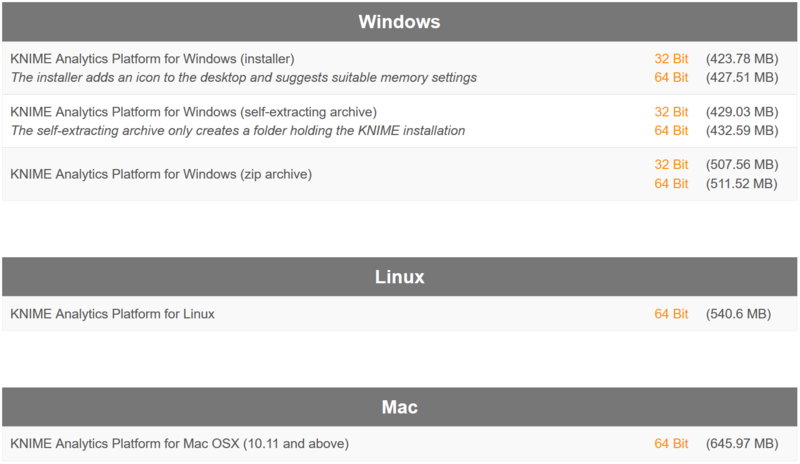 options used by the Java Virtual Machine when KNIME Analytics Platform is launched, range from memory settings to system properties required by some extensions. You can find knime.ini in the installation folder of KNIME Analytics Platform. On MacOS: To locate knime.ini on MacOS, open Finder and navigate to your installed Applications. Next, right click the KNIME application, select Show Package Contents in the menu, and navigate to Contents → Eclipse. The entry -Xmx1024m in the knime.ini file specifies how much memory KNIME Analytics Platform is allowed to use. The setting for this value will depend on how much memory is available in your machine. KNIME recommends setting it to approximately one half of your available memory, but you can modify the value based on your needs. For example, if your computer has 16 GB of memory, you might set the entry to -Xmx8192m. Clicking File on the menu bar and then Install KNIME Extensions…​. The dialog shown in Figure 2 opens. The Install KNIME Extensions menu provides the extensions that are available via the update sites you have enabled. For more information, take a look at our video on How to Install Extensions in KNIME Analytics Platform. Also see the Extensions and Integrations Guide. It is good to make sure that you always use the latest version of KNIME Analytics Platform and its extensions. Clicking File → Update KNIME…​. In the dialog that opens, select the available updates you want to install and then click Next. Proceed by following the instructions. KNIME Analytics Platform has to be restarted in order to apply the updates. 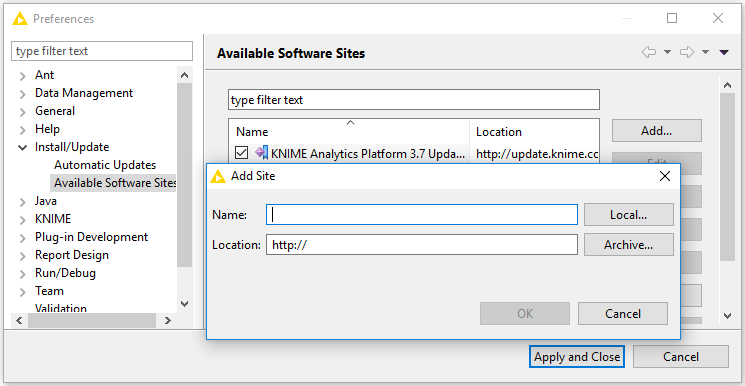 The Update Sites are where KNIME retrieves additional software in the form of extensions as well as updates. To see or edit the available update sites, select File → Preferences → Install/Update → Available Software Sites. KNIME Analytics Platform 3.7 Update Site: Provides all extensions and integrations maintained by KNIME: R, Python, H2O Machine Learning, Apache Spark for big data, and many more. Contains KNIME Labs Extensions, which are extensions that are not yet part of the set of stable KNIME extensions because their functionality may not yet be finalized. KNIME Community Contributions: Provides trusted community extensions, i.e. extensions created by the KNIME community, which have been tested for backward compatibility and compliance with KNIME quality standards. KNIME Partner Update Site: Provides extensions created by KNIME partners. Stable Community Contributions: Provides additional extensions created by the KNIME community. KNIME Analytics Platform 3.7 Update Site and KNIME Community Contributions are enabled by default. To install extensions that are not part of the above update sites, click Add to manually add the relevant update site, inserting the Name and Location as shown in Figure 4. After adding a new update site you will see it listed in the Available Software Sites. You must now enable it by selecting it from the list. If your working environment has limited internet access or you receive an error message “Proxy Authentication Required” when connecting to a remote update site (provided by a URL), you can install extensions from a local zip file. You can download KNIME update sites as zip files here. Select File → Preferences → Install/Update → Available Software Sites and enter the path to the zip file by clicking Add → Archive…​ as shown in Figure 5. If the same extensions are provided by a URL, you will first have to disable the update site by disabling it in the list. If the same extensions are also provided by a remote update site, you will first have to disable that update site by deselecting its entry in the Available Software Sites dialog and confirming via Apply and Close. These nightlies are a great way to get a sneak peek at what may be coming in the next version of KNIME and provide feedback and suggestions. They are not a particularly safe way to do real work.